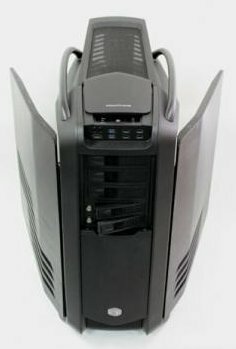 Cooler Master announced a prototype of its Cosmos II case has been chosen by Maximum PC as the Dream Machine of 2011. This steel/aluminium case is expected to hit retail stores in early October 2011, it will support CEB/e-ATX/XL-ATX/ATX/M-ATX motherboards and provide 10 (+1) expansion slots. There will be three 5.25" drive bays, thirteen 3.5" bays (X-docking: 2 / removable cage: 11) and thirteen 2.5" drive bays. A front I/O panel offers two USB 3.0 ports, two USB 2.0 port, eSATA and audio ports, and cooling is delivered by a 200mm LED front, three optional 120mm top fans, one 140mm rear fan, four 120mm side fans (2 are optional), and a 120mm HDD fan.